These are tables of congressional delegations from Florida to the United States House of Representatives and the United States Senate. Unlike many smaller states that generally have continuity in their districts when reapportioned every 10 years after the United States Census, Florida has seen a great deal of demographic change and population shifts since statehood. An individual numbered district today does not necessarily cover the same geographic area as the same numbered district before reapportionment. For example, Adam Putnam and before him Charles T. Canady have represented the 12th District since 1993, which was previously held by Tom Lewis. However, the area they serve identically covers much of the Polk County area previously represented by Andy Ireland when it was part of the 10th District. List of members of the Floridian United States House delegation, their terms in office, district boundaries, and the district political ratings according to the CPVI. The delegation has a total of 27 members, including 14 Republicans and 13 Democrats. Tables showing membership in the Florida federal House delegation throughout history of statehood in the United States. Until 1873, Florida had one seat, elected at-large statewide. Following the 1870 census, Florida was reapportioned a second seat. (1891–1893) Stephen R. Mallory, Jr. Following the 1900 census, Florida gained a seat in reapportionment. Following the 1910 census, Florida gained a seat in reapportionment. From 1913 to 1915 only, an at-large seat was created. Starting in 1915, however, four districts were used. Following the 1930 census, Florida gained a seat in reapportionment. From 1933 to 1937 only, an at-large seat was created. Starting in 1937, however, five districts were used. Following the 1940 census, Florida gained a seat in reapportionment. From 1943 to 1945 only, an at-large seat was created. Starting in 1945, however, six districts were used. Following the 1950 census, Florida gained two seats in reapportionment. Following the 1960 census, Florida gained four seats in reapportionment. (1969–1971) William V. Chappell, Jr. Following the 1970 census, Florida gained three seats in reapportionment. (D) William D. Gunter, Jr. Following the 1980 census, Florida gained four seats in reapportionment. (D) William V. Chappell, Jr.
(D) E. Clay Shaw, Jr. Following the 1990 census, Florida gained four seats in reapportionment. Following the 2000 census, Florida gained two seats in reapportionment. 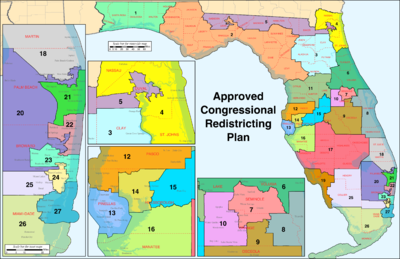 Following the 2010 census, Florida gained two more seats in reapportionment, which were redistricted for the 113th Congress starting in 2013. Tables showing membership in the Florida federal Senate delegation throughout history of statehood in the United States. As of January 2019 [update], there are six former U.S. Senators from the U.S. State of Florida who are currently living at this time, two from Class 1 and four from Class 3.